My last post on academic writing was a reflection on how to use quotes. I want to follow up on this, because referencing is an essential element in academic writing. When we work on a topic, we’ll usually have to read many authors who also treated it. In fact, we will usually start with literature research and reading, even before we decide how to organize our work. Some sources are so obviously relevant (or so highly recommended by our director) to our text that we can immediately start with stage 2. Rule 1: Write as you read. Don’t just read. This rule is simple: if you know it is relevant, don’t just read it, type it into a document where you know you’ll find it again. We all feel tempted to only read and not write, but it is inefficient for any type 2 source. Don’t be lazy. Academic reading is not only reading for fun. It is reading for writing. Once you really go into “writing mode” and your deadline is coming closer, time is more and more precious. Anything that doesn’t exist in the same form as the document you write will only become a part of your text at a cost.You don’t want to lose time looking for quotes that are still in book form a second time, you want to be able to just copy-paste them. If relevant sources are not in documents on your computer (or online, e.g. on google documents) where you can easily find them when you start writing your text, you did something wrong. You will then lose a lot of time searching and bringing it into your document. If you use books from the library you often will have returned them. It can take many days just to get to one passage (again). This is frustrating if you know that you already had it on your desk when time was not so pressing yet. Rule 2: Create simple documents. As soon as you start to read a type 2 source or realize that a source really is type 2, create a new document and put the complete bibliographical information at the top. You can do this on word, OpenOffice or wherever you want – but it is best to do it on the same program as the one you are planning to write your text with, so you don’t have compatibility issues when you copy-paste to your thesis document. Name the document after the author, then save the document in the Readings folder. Do this not only when a document is in paper form, but also when it is in electronic form. Once you go into “writing mode” the excerpts of your sources should be as similar as possible to the text you are writing for easy integration. When another text by the same author appears, reopen the author document and create a new heading with the bibliographic information for the new text. This is also a good moment to add the reference to your citation management software (like Endnote, Citavi, Mendeley, Zotero…). As you read, re-type or copy-paste any passage that could become relevant – or when they are too long, sum them up – into the document. Please always write the page number under any quoted passage. If a passage runs over two or more pages, put “[end p. x]” whenever a page ends in the quote. You’ll find an example from my own Reading folder at the end of this post. I told you to create two folders, one for readings, one for topics. As you identify the themes for your text (e.g. your thesis), also create thematic documents. This is the place where quotes or paraphrases should go based on themes rather than author. When you read a lot, you will often remember that you read something but without remembering where you read it. If you don’t have thematic documents, it can be very hard to find the passage again. This is true even when you have a powerful search engine, because passages may treat a topic without ever mentioning it explicitly. Based on what you already know to be relevant themes for your text, you can create a first series of documents when you first start with this system. But you should keep adding new thematic documents as you go on reading whenever a relevant theme reappears in different texts. Based on this process, you will sometimes discover themes you had not deemed relevant when you started the research project. In my thesis on narrative in pictures, for instance, I discovered that authors regularly distinguished narrative from other modalities. But what they opposed it to, often varied. Some made the traditional distinction between narration and description. But others opposed narration to argumentation, or to iconicity, or to ambiance, etc. So I decided to create a document that was called “What narrative is not”. It would of course have been impossible to find all the things narrative is not for different authors with the search function on my computer without remembering each single distinction, because “narrative” was a key term in all of my documents and for each author the key-term was different. In the subject document, write at least the author, name of quoted document and page where you found the quote. The full bibliographical info should either be in the author document or a bibliographical software you use. If one quote is relevant to more than two subjects, put it into two than more documents. Why not stick to thematic documents alone? Students sometimes ask me why the thematic documents are not enough. There are at least three reasons for this: having author documents as well allows you not to make your excerpts too short, to roughly contextualize quotes/paraphrases in the original publication and, most importantly, it prepares you for expanding your research beyond the themes you first identified as being relevant. Having an author document as well as subject documents allows you to find relevant passages that are not on the themes you first thought were the most important to you. It also gives you a place for passages where you feel that they are “somehow important” or just “great in themselves”, but do not yet know in what context you may possibly use them. Such passages go into the author document, where you can find them later, sometimes years later, when you work on a related subject. it will allow you to stay focused on your own writing and not to get dragged back into the argument of another author once you work on your own text. if you do it reliably and keep on working on the same topic for a while, it allows you to eventually not have to go online or to the library (very often) any more, because everything you need to build your own texts will already be on your computer. This makes you much more independent and much faster. For me it has been like this since I finished my Ph.D 3 years ago – and I think I can still go a long way with the sources on my computer. The document is called “Rimmon-Kenan”, the heading of the section of the document is: Shlomith Rimmon-Kenan, Narrative Fiction: Contemporary Poetics, Routledge London/New York, 2nd edition, 2002. What complete bibliographic information is differs from source to source, but for articles in journals it is, for instance, “Author, “Name of Article”, Name of Journal, Year, Volume, Issue, pages where the article is to be found”. For monographs it is at least “Author, Name of Book, Publisher, Place, Year”. The same passage could appear in a thematic document called “Time of the told and time of the telling.” It would then simply end like this: “(Rimmon-Kenan, Narrative Fiction, p. 46/47). If you found this helpful, do not hesitate to comment or share. Media Markt is an electronics superstore that must have killed more than one small shop that sold TVs, HiFi, Computers, etc. Now they are fighting a bigger opponent: a media, the Internet. Can they win? MediaMarkt was launched in Germany in 1979, and according to Wikipedia there are now 235 stores in Germany, followed by over 60 stores in Italy and over 40 in Poland. This makes it Europe’s largest retailer for consumer electronics. 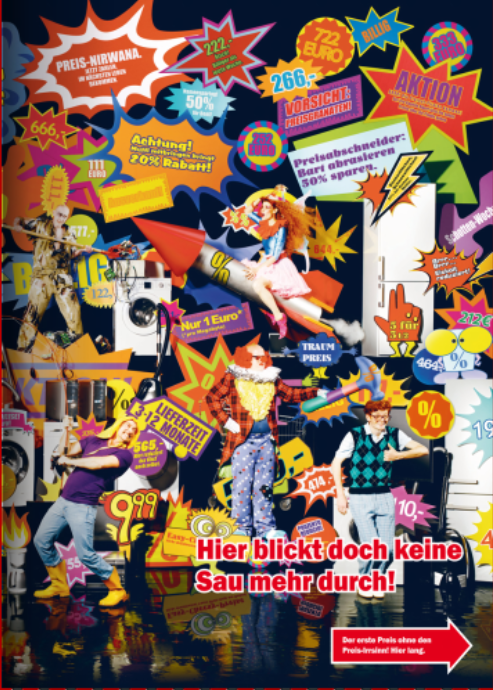 I know Media Markt since I was a kid, because their ads appeared nearly weekly in the local newspapers my parents read. They’d usually be on several pages and would show crazy looking people. Their slogan was “Ich bin doch nicht blöd!” – which means something like “Cause I’m not stupid!”. While there are now stores in 16 countries, it is clear that Germany has remained the main market. This is where the interesting part starts: As opposed to other electronics stores, who developped their web-presence, Media Markt still focusses on in-store sales. Their main communications tools are posters and generous newspaper inlays with often more than 6 pages. Earlier this year, Media Markt launched at least one campaign where they guaranteed to offer a price below anything a « serious webstore » would offer. It turned out that they weren’t always able or willing to keep the promise, doing some damage to their brand-image. But now, they went a step further. Perceiving the World Wide Web as a serious threat, they launched a new campaign all over Germany where they clearly defy the Internet. I learned about it – how else? – when I saw a prospectus at my dad’s house this Thursday. (this is a dad, by the way, who always argues with his girlfriend about going to Media Markt – which is his preference – or ordering over the Internet – her favourite method – which in turn shows that Media Markt is right to argue.). 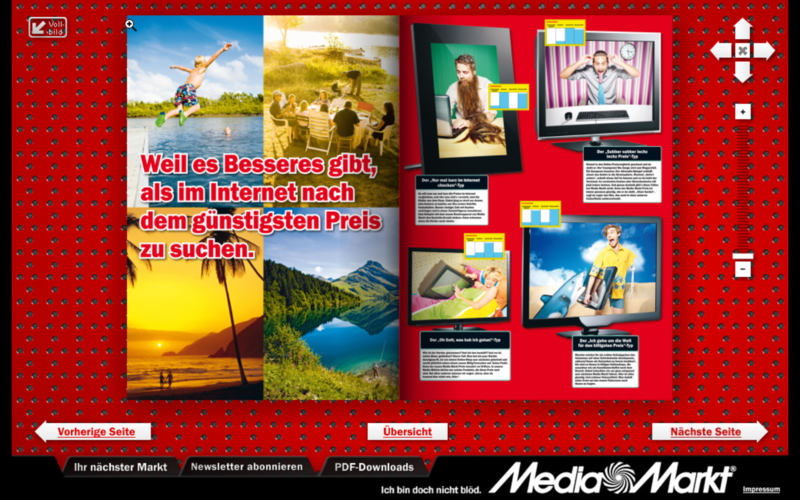 The theme of the new campaign that is still running wild is “The new Media Markt Price”. The campaign attracts attention by caricaturing short term offers with a graphical layout that features sentences like “Bring your mum and get 20% off”, “The Nirvana of Price. Pay now for delivery in your next life” or “Cutting down the price. Shave your beard and get 50% off”, etc. Both style and content work very well together and are reasonably funny. A little arrow tells you to turn the page for a way out of the price jungle. You turn the page and as opposed to the crowded first page, you’ll face a very clear, simple layout. This is what the philosopher Monroe Beardsley calls “Fusion”: form and what you want to express are the same. They say their price is clear. They make the page look clear. Media Markt tells you that the store managers will check online offers by major providers on a daily basis and adapt the price. Supposedly this means the end of complicated and weird short term offers. The campaign is formally interesting. It’s unfolds like a narrative. It starts with a (caricature) description of the current state of affairs. There are tons of strange short term offers that make people run to stores. 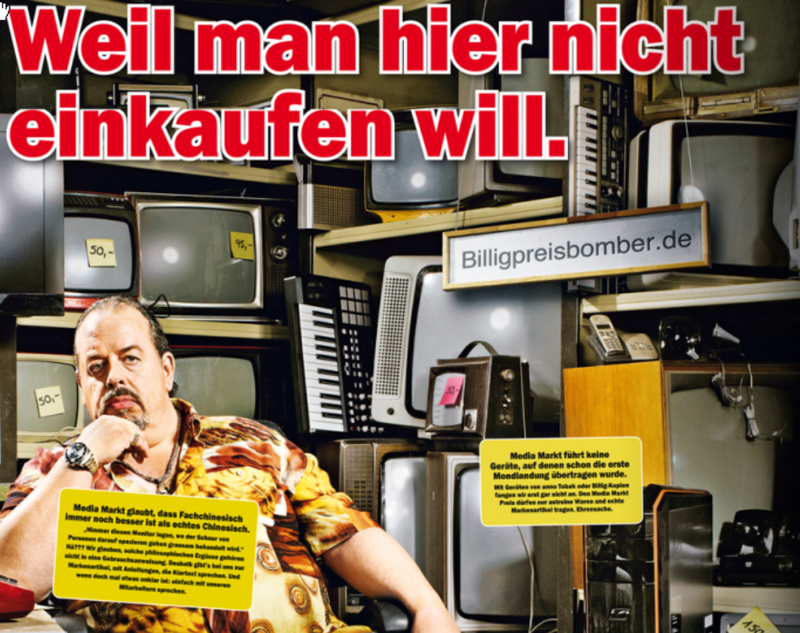 Then it offers a solution: “Das Ende des Preis Irrsinns” (The End of the crazy prices). Then it develops different aspects of the solution: ethical (save jobs of the department store workers), practical (don’t loose time looking for offers), hedonistic (do other things with the time you save), qualitative (make sure you don’t buy a fake). This is advertisement as an argument. Just the way it used to be in the olden days. The prospectus shows a supposed webstore where you wouldn’t want to buy, suggests that items you order on the Internet may just as well be imitations, and says: Because their are nice things than to look for the best price online, offering a typology of web-price-hunters. I must say that I’m impressed. This is a store, a company, overtly fighting a medium. I don’t know any other examples of this, but I would be interested to learn. It’s as if Sony had fought the CD Player, because they were selling Walkmen. Or as if Grundig had fought the DVD, because they were selling VHS. Actually, it’s more than that (and a bit different). It’s MediaMarkt fighting the new media. “HardDisk recording kills DVD recorders kills Mini-DV kills VHS kills Super8 …” That’s the way things go. Now here’s a megastore that has a new enemy: a media. 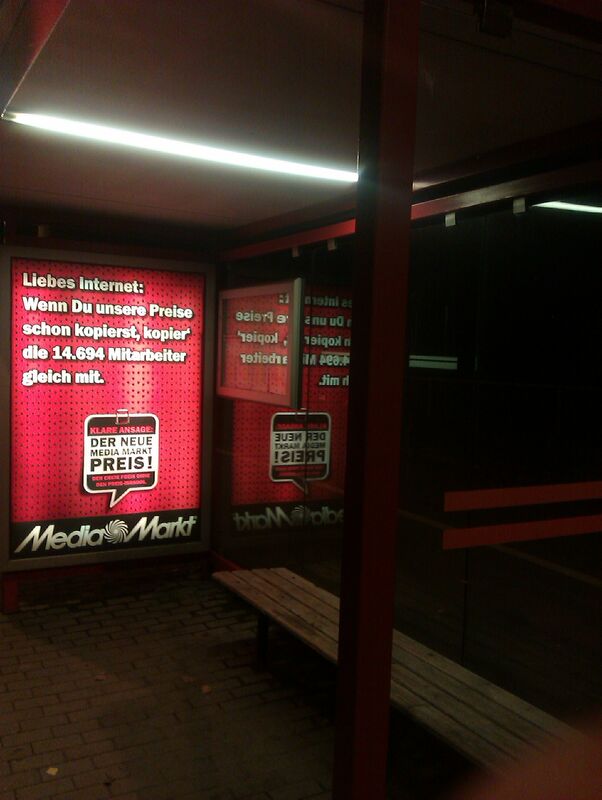 And maybe MediaMarkt’s ad campaign even has lateral benefits for other stores that they compete with. “Video killed the radio star…”? Well, no, it didn’t. Sometimes new and old co-exist, because they offer something different. Media Markt tries to show that they can do all the internet can, which is, basically, offering a better price. But that they also employ many people, make sure the quality is good, etc. Do I think they’ll succeed? Maybe. In any case it’s a strong statement that makes people think about something they usually take for granted. I’m not sure that it will help, but the initiative seems mind-blowing to me. Here’s the link to their campaign page online.